Like many tribal societies, the ethnic groups of Ethiopia put a strong emphasis on martial ability. Boys were trained from early childhood in the use of the sword, spear and shield. Every man yearned to own a gun, not just for what it would do for him on the battlefield, but also for hunting. The Italians faced an Ethiopian army larger and more organized than in all of its recent history. Menelik had centralized and streamlined the taxation system, bringing in more goods to the central government. This allowed Menelik to keep a larger standing army, and support a huge temporary army at need. Most taxes were in kind – food or labour that went directly to support the soldiers. 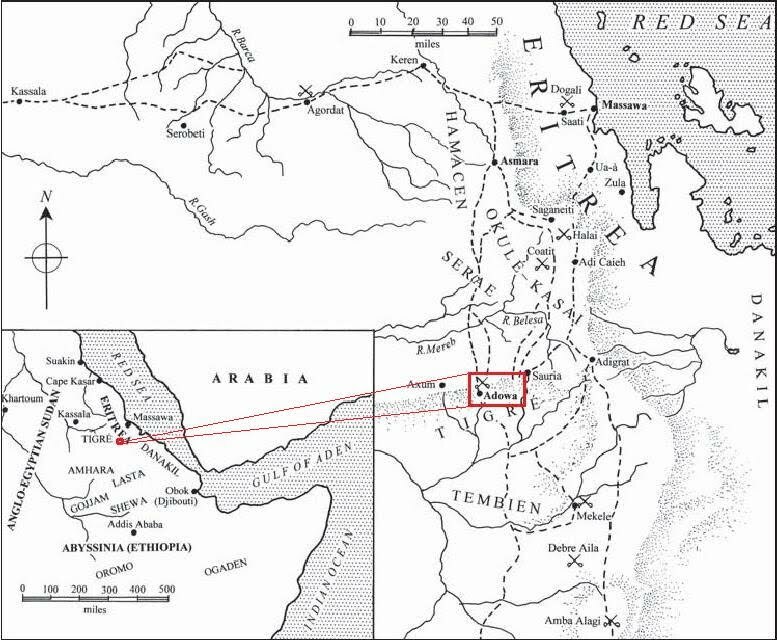 Menelik also ordered an extensive geographical survey in order to increase revenue, and to identify land that could be given to soldiers as a reward. His government also enjoyed the revenue from customs duties on ever-increasing international trade. While the emperor maintained only a relatively small standing army, the entire countryside could be mobilized when a Negus ordered a kitet, or call to arms. This was made by proclamations in marketplaces and other gathering spots, and large negarit war drums were beaten to alert outlying farms. One even acted as a platform for the messenger, who stood on an upturned drum and read the proclamation while a slave held his lance and robe next to him as symbols of his rank. While the king was not always in full control of his territory, `beating the kitet’ was generally effective; it usually summoned men to fight against a common enemy, and always offered a chance for plunder and prestige. The Ethiopian army on the march looked more like a migration. Many warriors brought their families along, and wives and children would cook and gather provisions and firewood. During the march there were no stops until a camp was found for the night. The wealthier warriors had servants to carry their equipment and mules or horses to ride. All these extra people and animals had to be fed, increasing the need to keep mobile. While some food was carried by the men themselves or on muleback, the army was expected to live off the land, and foragers spread out over a large area. The central highlands of Ethiopia are green and filled with game, so as long as an army kept moving it could feed itself, and, being relatively unburdened, it could move quickly. If it stopped for long, however, it would soon starve; this was a major problem if the army had to besiege a fortification, or – as in the run-up to Adowa – wait for an enemy to make the first move. Menelik realized that the large force he was assembling might run into difficulties of supply, especially considering that some regions he planned to march through were suffering from famine, so he ordered depots of food to be placed at regular intervals along the lines of march. This allowed Menelik to wait out the Italians on a couple of occasions. This need for strategic speed affected how the Ethiopians made war. They avoided long conflicts in favour of big showdown battles in which they could destroy the enemy army and force favourable terms from the enemy commander. Drawn-out campaigns could prove counterproductive, since the army would have to ravage the very land they sought to conquer, forcing the inhabitants to flee. During Menelik’s long wait before Adowa the area was picked clean of food and most of the trees were chopped down for firewood. Shortages of ammunition, and the often fragile coalitions among the leaders, also encouraged quick campaigns. To aid the advance, teams of workmen moved ahead of the main army clearing the way of trees and stones and searching out the best passes through the mountains. The Negus Negasti kept a group that outsiders called the `Royal Engineers’, but while some were undoubtedly skilled at complex operations such as building bridges, most were simply labourers. The Ethiopians had no formal medical corps. Healers trained in traditional medicine followed the army, but were too few to care adequately for the huge numbers of casualties. Still, traditional healers did the best they could at setting limbs and cleaning out wounds. One method for sanitizing gunshot wounds was to pour melted butter mixed with the local herb fetho (lapidum sativum) into the wound. In battle the warriors’ families cared for the wounded, collected guns from the fallen to distribute to poorly armed warriors, and fetched water for those fighting. This last detail was important; at Adowa, Itegue Taitu had at least 10,000 women bringing water to the warriors, while the Italians suffered from thirst throughout the day. 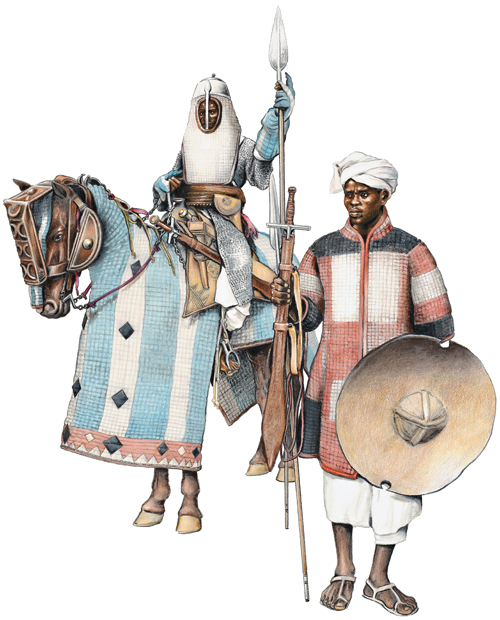 The Ethiopians lacked uniforms; common warriors wore their everyday clothing – generally a white, cream, or brown length of cotton called a shamma that was wound around the body in various ways. Chiefs and higher nobility wore a variety of colourful garments, including the lembd, a ceremonial item vaguely resembling the cope or dalmatic of Christian churchmen (see `Plate Commentaries’, below). If a man had slain a lion during his career, his formal clothing could be embellished with the lion’s mane. 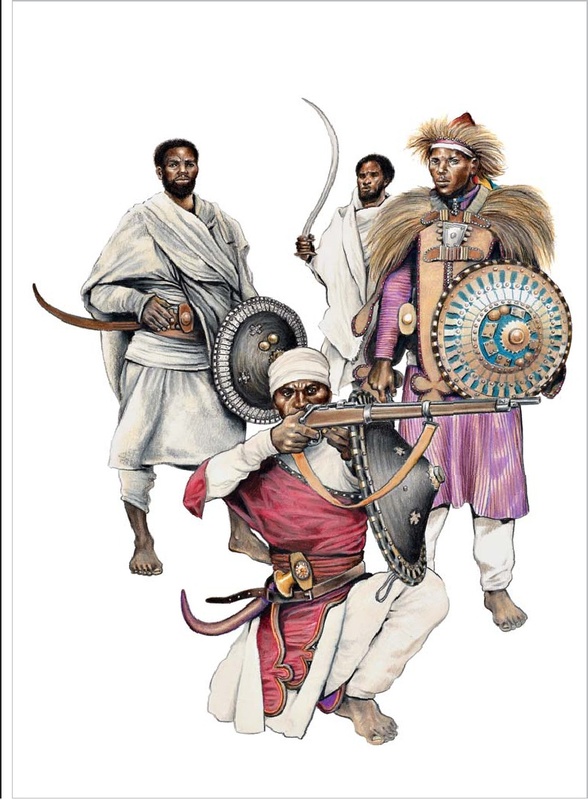 Despite Western preconceptions, and the employment of antique firearms by the poorest warriors, the majority of Ethiopians were armed with large-calibre, breech-loading, mostly single-shot rifles no more than 30 years old since they had first appeared in Western armies. It is estimated that Menelik’s army may have had as many as 100,000 of such weapons in 1896. Until the collapse of diplomatic relations he had been able to purchase large numbers of rifles from the Italians, and also from the Russians, French and British. After Italian sources dried up Menelik strove to increase his other imports, and a key figure in this trade was Ras Mekonnen of Harar, a city in eastern Ethiopia with trade links to the Red Sea. Individual chiefs also stockpiled arms, and issued them to their best warriors in times of need. The types used by the Ethiopians included the elderly British 1866/67 Snider – an 1856 Enfield muzzle-loader converted into a single-shot breechloader. Used on the British Magdala expedition of 1867-68 against the Emperor Tewodros II, it had a massive 14.6mm calibre and a hinged breech action. However, the Ethiopians also had considerable numbers of the superior 1871 Martini-Henry – the classic British single-shot, lever-action, falling-block weapon of the colonial wars, firing 11.43mm bullets. The French 1866 Chassepot was another second-generation breechloader, a bolt-action, single-shot weapon taking 11mm paper and card cartridges; but again, the Ethiopians also had larger numbers of more modern 1871 Le Gras rifles, in which the Chassepot’s paper cartridges were replaced with 11mm brass rounds. Menelik’s warriors even had some 1886 Lebel 8mm bolt-action magazine rifles; with eight cartridges in the tubular magazine below the barrel, one in the cradle behind the chamber and one `up the spout’, these took ten rounds. The Lebel’s smaller-bore, smokeless-powder ammunition was the most advanced in the world (all the other types took black-powder rounds, which produced a giveaway cloud of white smoke and fouled the chamber fairly quickly with continuous firing). The Peabody-Martini was an 1870 Swiss modification of an 1862 Peabody design from the United States. Widely manufactured across Europe, it had a single-shot, falling-block action in various calibres from 10.41mm to 11.43 mm. Probably the single most common rifle in Ethiopian use was the `rolling-block’ Remington, another American design very widely built under licence in the 1860s-80s, in calibres up to 12.7mm (.50 calibre). The Winchester 1866 was a lever-action 11.18mm calibre weapon with a tubular magazine taking 12 rounds; several later models used a box magazine. The Russians had supplied the Ethiopians with a fair number of US-designed, Russian-made Berdan 1864 and 1870 rifles; both were single-shot 10.75mm weapons, the 1864 model with a hinged `trapdoor’ breech and the 1870 with a bolt action. Sources also mention German Mausers, most likely the 11mm single-shot, bolt-action 1871 model. The Ethiopians also had some examples of the Austrian 1878 Kropatschek, an 11mm bolt-action repeater with an eight-round tubular magazine. This wide variety of rifles and calibres inevitably created local shortages of ammunition. Menelik instituted a quartermaster system, and individual leaders may have helped supply individuals who were short of cartridges, but in general each man was expected to supply his own (and probably `collected his brass’ for artisan reloading). Cartridges were so valuable they were often used as currency; being hoarded, they tended to be older than was ideal, but Menelik and other leaders strove to purchase as much new ammunition as possible, and it appears that his forces at Adowa were well supplied. Still, out of habit the Ethiopian soldier conserved his ammunition, preferring to get up close before firing. Wylde noted they `made good practice at up to about 400-600 yards, and at a short distance they are as good shots as any men in Africa, the Transvaal Boers not excepted, as they never throw away a cartridge if they can help it and never shoot in a hurry’. Despite the wide availability of firearms, many Ethiopians still went into battle with more traditional weapons. The shotel was the favoured type of sword, a heavy steel weapon curved like a scimitar, but with the sharpened edge usually on the inside of the curve so that the warrior could stab around the edge of an opponent’s shield. It was carried slung on the right side, so that the left (shield) arm had a full range of movement. Steel-headed spears were pretty much universal among men and boys for defending their flocks from wild animals; generally about 6ft long with a leaf-shaped head, they could be thrown, but were more often used for thrusting. Small shields completed an Ethiopian warrior’s kit. Styles varied among the tribes, but the most common was a circular, conical shield made of hide and covered on the front with coloured cloth such as velvet. Many were decorated and strengthened with strips of brass, tin or more valuable metals; a shield was an easy way for a warrior to show off his wealth and status, and many were quite elaborate. Cavalry was common in the Ethiopian lowlands, and the horsemen of the Oromo were especially renowned. Horses were useful and acted as a status symbol, so every warrior wanted one. The Ethiopian horse is smaller than its European counterpart and can negotiate terrain that would stop a European steed. Nevertheless, Ethiopia’s mountainous terrain and dense thickets of thorn-bushes often meant that battles had to be fought on foot. Weaponry for cavalrymen was identical to that for footsoldiers. 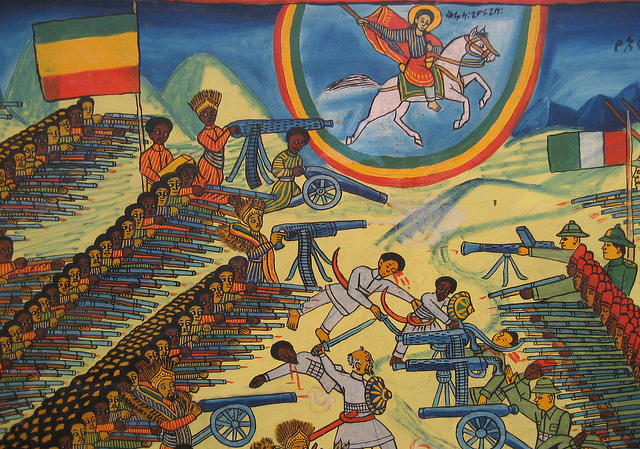 The Ethiopians had 42 guns at Adowa. It is unclear what types of cannon were used, but sources agree that they were a mix of older guns bought or captured from various sources. They included Krupps, and mountain guns captured from the Egyptians when they tried to take Ethiopian territory in 1875 and 1876, or left behind when the Egyptian garrison evacuated Harar in 1885. One source describes the artillery as `of all calibres and systems’. There was a chronic shortage of shells, and thus crews had little chance to practise. While the Ethiopians were capable of bombarding a fort, as at Mekele, they had difficulty in manoeuvring guns and laying down accurate fire in broken terrain against a moving enemy; Italian eyewitnesses said that the Ethiopian artillery made a poor performance at Adowa. More effective were the several automatic cannon that Menelik brought to Adowa. A detailed listing is unavailable, but Maxim weapons are mentioned, and perhaps six were 37mm Hotchkiss pieces. Produced by an American company from 1875, these were later licence-built in Europe, particularly France. Early versions were multi-barrel revolvers, fired by turning a crank like a Gatling gun; later models had a single barrel and were fed by a belt. These later-model `pom-poms’ fired both solid and explosive rounds, and were superior in range and accuracy to the Italian artillery. This entry was posted in Armies by MSW. Bookmark the permalink.